This Cryo Card has the same features and qualities of the regular Cryo Card but due to a manufacturing error of the stainless steel there is a slight scratch on the back of the card. It can be seen at certain angles so it does not allow us to sell the product at full price. The scratch does not affect the functionality of the card in any way. 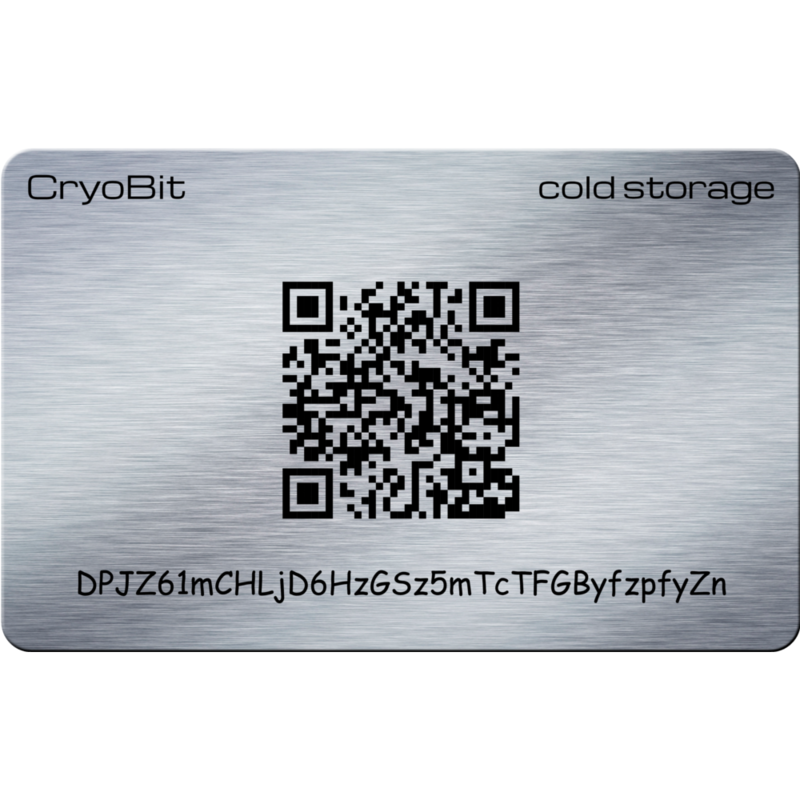 Cryo Card is the ultimate solution to offline cold storage of all crypto-currencies. Please indicate the custom text and location on the card you would like the text. If you would like a custom logo please provide an image link and where you would like it located. Select a Currency type of “Other (No Currency Logo)” above if you plan on using your own custom logo in place of the standard logos. We will send you a mockup of the card by email for your approval before manufacturing and shipping your card. 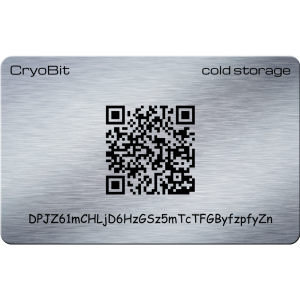 Cryo Card is the ultimate solution to offline cold storage of all crypto-currencies. Engineered to withstand anything mother nature can throw at it; Cryo Card’s base layer is constructed of AMS 5524 Stainless Steel, an aerospace grade metal that demonstrates both high heat and corrosion resistance in all environments. It is highly resistant to both acids and bases, fresh and salt water, and temperatures of up to 2500°F (1370°C). 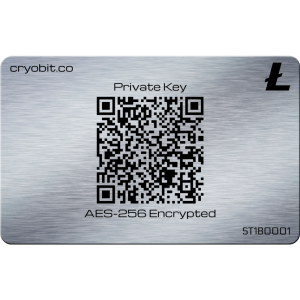 Cryo Card is then marked by a high-contrast proprietary ceramic-glass material that exceeds the metal’s oxidative and thermal performance. In addition, this marking material is virtually scratchproof. Since the marking is chemically bonded to the base metal and is comprised of a very hard ceramic composite, it is nearly impossible to remove by any form of physical or chemical abrasion – without first removing the metal layer underneath. Cryo Card was also engineered to withstand the ultimate enemy of crypto-currency storage – trust. Utilizing offline AES-256 encryption*, your newly generated or existing Private Key can never be known to us or any other entity that does not know your personally chosen passphrase. The encryption process is performed in your own browser – not on our servers – so your passphrase is never seen by us. 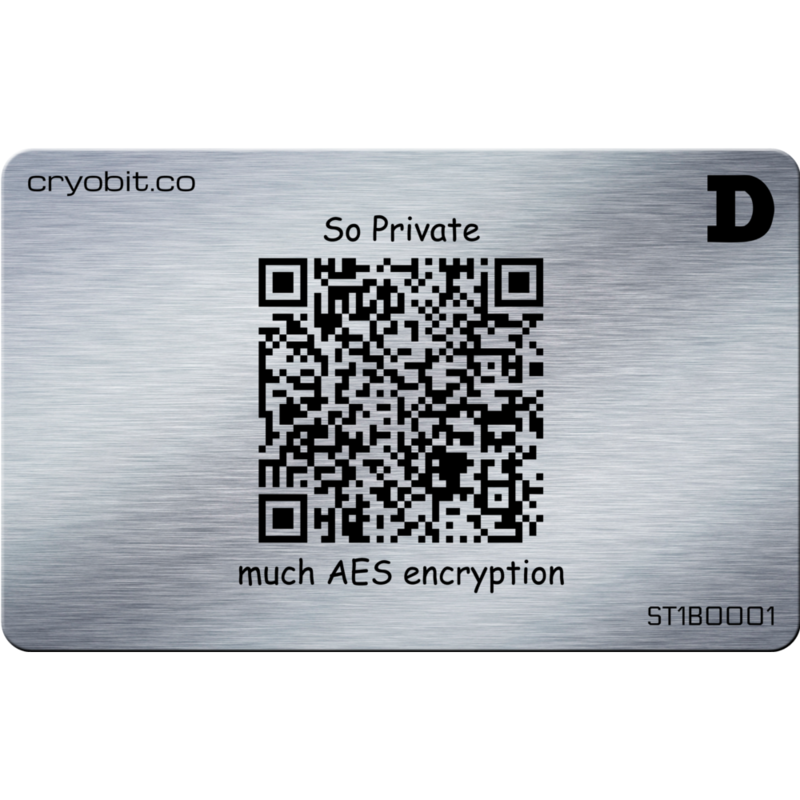 You can even disconnect your device from the Internet while generating and encrypting a new encrypted Private Key (or encrypting an existing one) and re-connect to complete your order. This can help to ensure that your Private Key and chosen passphrase are not potentially compromised. We also accept previously encrypted Private Keys for new orders. 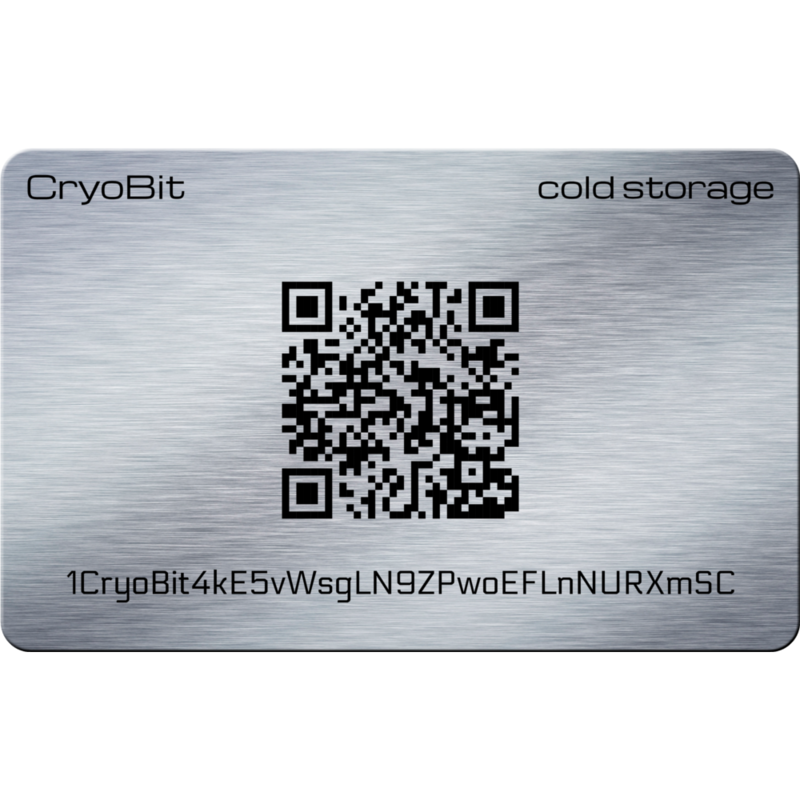 However, we will not accept unencrypted Keys for any Cryo Card order. All Cryo Cards, Public Address cards, and Passphrase cards are custom made in-house per your order. This adds an extra layer of security as no outside manufacturer has visibility to your card’s (albeit encrypted) information. All cards ship the next business day from when the order was placed for fast and immediate delivery. Your cards are shipped in a tamper-proof envelope and placed within an opaque sleeve for additional security and peace of mind. We ship worldwide. Expedited shipping for all orders is also available. 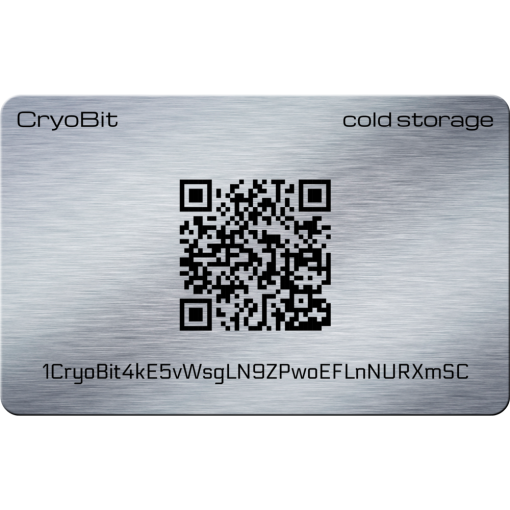 Copyright © 2017 Cryobit LLC. All Rights Reserved.